In this article, we're going to look at using WebSharper, a web development framework for .NET, to build a small web application from scratch that features an HTML5-based clock. Pagelets: the basic building blocks of client-based WebSharper applications. Pagelets correspond to content and/or functionality injected into static markup during the execution of the page. A WebSharper pagelet is an instance of the ordinary System.Web.Control class and can be embedded directly into ASPX markup as well. However, to really benefit from the functional approach, you will use a WebSharper sitelet to expose the pagelets in this article. Sitelets: first-class, composable website values in F#. WebSharper sitelets are a powerful abstraction that enable you to define web sites in a concise and declarative style with nothing but F# code. These sitelets in turn can be combined with other sitelets to form larger ones, or enhanced in various ways. For example, as you will see in this article, you can use sitelets to add authentication. Formlets: first-class, composable web forms represented as F# values. The WebSharper formlet library comes with various primitives for constructing basic formlets and functions to combine and enhance them. WebSharper formlets can also encode dependencies among inner formlets and implement different rendering styles and user stories such as wizards in a concise and straightforward manner (known as flowlets). Templates (aka master pages): WebSharper templates are represented as F# functions with strongly typed placeholders. 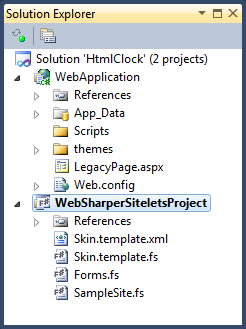 Out of the box, you can use a Visual Studio item template for adding a page template (ending with .template.xml) to your WebSharper sitelet project. These page templates are ordinary XML files, out of which the build system will distil F# source code that represent your templates. For the sample in this article to work you must have WebSharper installed. If you don’t yet have it, go and grab the latest version from http://websharper.com/latest/ws2, which at the time of writing this article is 2.3.28. WebSharper works both for Visual Studio 2008 and 2010, but be sure to have F# and Visual Web Developer installed, otherwise most of the WebSharper project templates will not work. 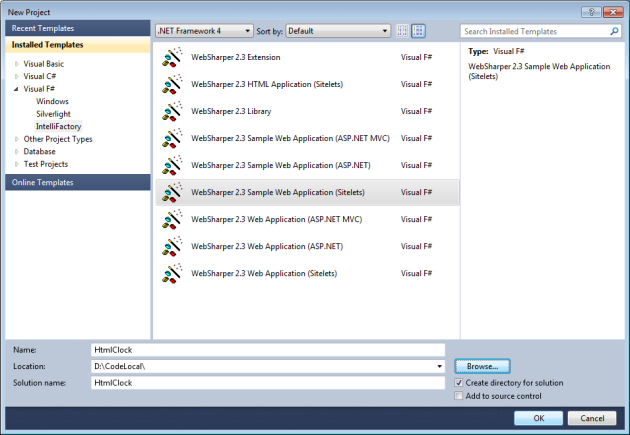 Figure 2 : Websharper project templates in Visual Studio. Figure 3 : The Project Structure in Solution Explorer. The latter project is an F#/WebSharper sitelet project, this contains all the code for your sitelet-based web application. It comes with a sample skin template (these are files ending with .template.xml and always have a corresponding .template.fs file pair generated automatically) and a couple of files that define the functionality for the sample web application. Although this sample is based on this template, feel free to wipe the content of Forms.fs and SampleSite.fs and copy and paste the code from this article instead. Before you do that, you can run your application as a regular ASP.NET application (Ctrl+F5) to see what it looks like, and play with the code to get a feel for it. Next comes the code responsible for drawing a clock on an HTML5 Canvas element. This is split into two parts: the ClockInternals module contains the Main function that does the actual drawing, and a helper AnimatedCanvas function for embedding it in some HTML markup and asynchronously updating the display every second. let ctx = canvas.GetContext "2d"
The ClockControl type then exposes this clock as a WebSharper pagelet, so you can embed it in your sitelets or ASPX markup easily later. Now with the clock functionality implemented, and a ready-to-use template in your project, it’s time to put a sitelet together. Initially, it will have two pages only: a Home page where users land when they arrive at the site and the Clock page where we show the local time as an HTML5 animation. You will represent these aspects as actions that are served from the sitelet and model them as an F# discriminated union with two shapes: Home and Clock. /// Actions that corresponds to the different pages in the site. I have added a couple helper functions and a Template function that uses the Skin template you have in the sitelet project with some customizations like footer and side bar messages. /// to make sure that browsers don't show a cached version. /// A template function that renders a page with some customizations. Armed with this Template function, you can define the content of your two pages in a separate inner Pages module for clarity. /// The pages of this website. /// A simple page that shows a clock. Once these are defined, you can go ahead and create the main sitelet that corresponds to your entire website. This has two parts: first, you create a single-page sitelet for the Home page mapped to the Home action under the root of the application. Second, you create another sitelet that maps each action to its corresponding content page. There are several ways to construct WebSharper sitelets, here you used the most convenient one and inferred the URL space that goes along with the site action type using Sitelet.Infer. This sitelet constructor assigns URLs based on the action type it’s associated with, in your case these will be “/Home” and “/Clock”. Finally, you compose these two sitelets into a single sitelet using Sitelet.Sum. /// The sitelet that corresponds to the entire site. // A simple sitelet for the home page, available at the root of the application. // An automatically inferred sitelet created for the basic parts of the application. // Compose the above sitelets into a larger one. The only remaining part is to expose this sitelet value so that it can be served by the sitelet handler in the web application project in your solution. All you need to do is to define a type for it and annotate it on the assembly-level as a WebSharper website. As a side note, your web application project is a standard empty ASP.NET project with a dummy page called LegacyPage.aspx. You referenced this page in your Template function simply to have a feeling about referencing pages the traditional way (via strings) and the WebSharper way (via actions). Note that WebSharper sitelets can have either no manual control (as above, using Sitelet.Infer) or full manual control over the URL space into which they map. Furthermore, sitelets can be combined from smaller ones that use different strategies for defining their URL space. Therefore, it is recommended that you always use safe URLs (via actions) and not strings to reference pages in your sitelets. Figure 4 : The final application. 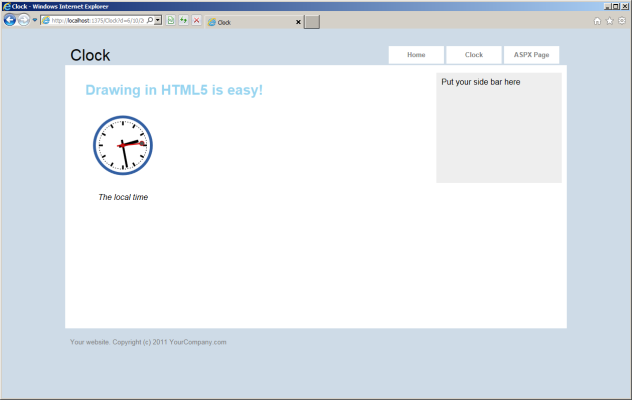 In this article, we’ve seen how to build a basic HTML5 application using Websharper and F# Sitelets. In part 2, we’ll see how to extend this simple web application with authentication. We will implement Login/Logout functionality and protect the Clock page with authentication to require users to log in before they can see the local time.